Assam chief minister Sarbananda Sonowal again asserted that whatever Prime Minister Narendra Modi has done for the people of Assam in five years, the Congress could not do it even in their 70 years of rule. 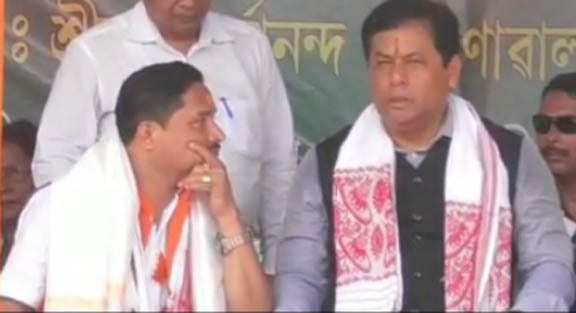 Chief minister Sonowal said this on Saturday while addressing an election campaign rally at village Dipila in Sipajhar LAC of Darrang district for BJP’s Mangaldai Lok Sabha candidate Dilip Saikia. “Prime Minister Narendra Modi has considered the people of Assam and the Northeast as very close to his heart. What he has done in the last five years for the people of Assam and Northeast couldn’t be done by the Congress even in 70 years,” said Sonowal. Addressing the people of Dipila, which was once considered to be a hot bed of Assam agitation, chief minister Sonowal underlined the issue of Citizenship (Amendment) Bill, 2016 as nothing but misinterpretation created by the Congress for its own benefit and recalled the speech of Prime Minister Modi in his recent visit that the CAB will be passed in the interest of the people of the area. “As Modi has announced in Silchar, the people of Assam shouldn’t panic for CAB and it will be passed without affecting the interests of the people of this area,” Sonowal said. The rally, attended by relatively a small crowd of around one thousand five hundred people, was also addressed by candidate Dilip Saikia and two BJP MLAs of the district Binanda Saikia and Gurujyoti Das among others. Earlier, Sonowal arrived at the venue in a chopper at around 1:30 pm. Chief Minister Sonowal is scheduled to address another rally in the Lok sabha constituency on Sunday at Bongali Gaon under Rowta Police Station bordering Darrang and Udalguri districts.